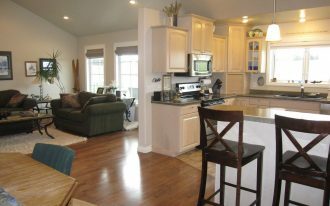 Kitchen is one of focal points for families where it is central of entertaining, cooking, and even spending spare time with lovely people. 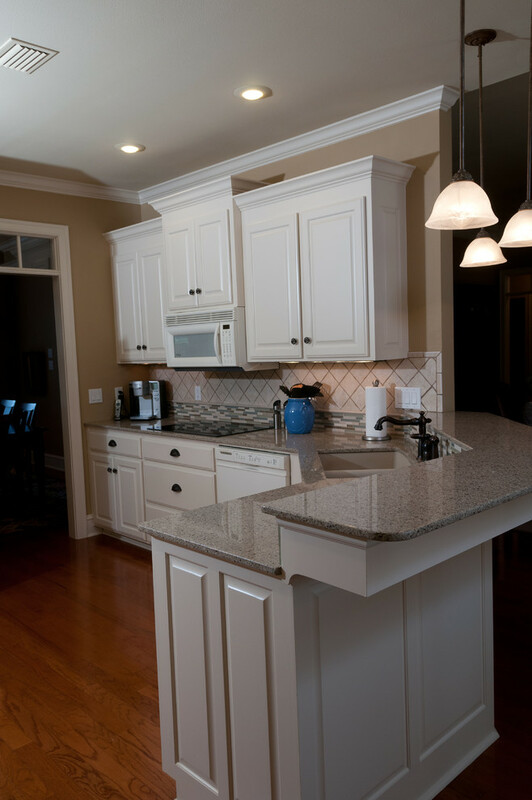 For this reason, it’s important to make comfort and function as the main priority if you want to remodel or improve your kitchen. Every kitchen is designed in different options of design because the house owners have different taste, need, and lifestyle. 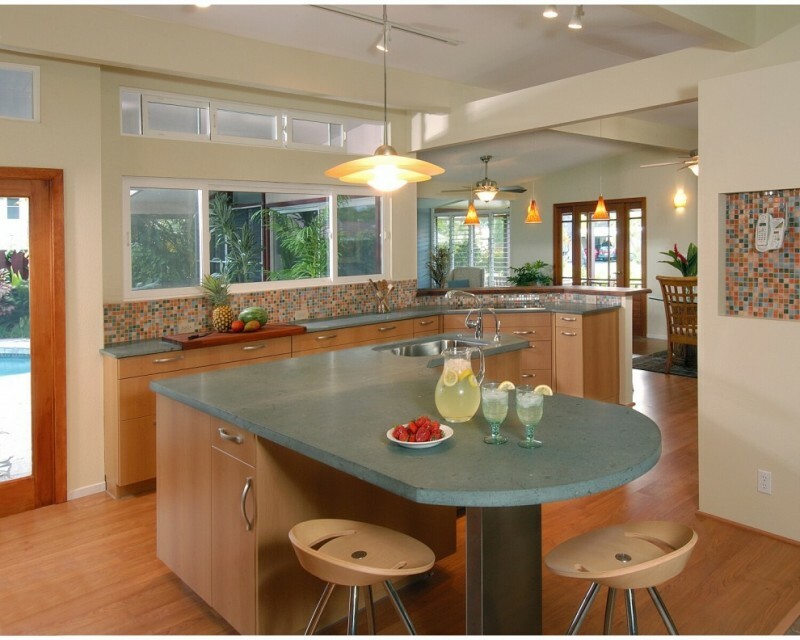 Kitchen remodel Hawaii, for instance, nowadays becomes popular and many people attract then choose it as their new kitchen model. 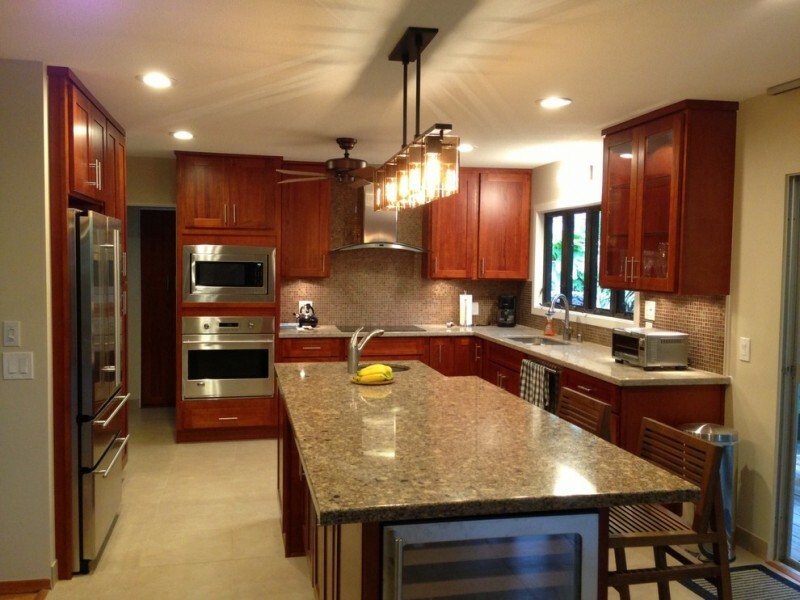 If you are so curious about kitchen remodel Hawaii, here we are displaying top 30 design of kitchen remodel Hawaii. 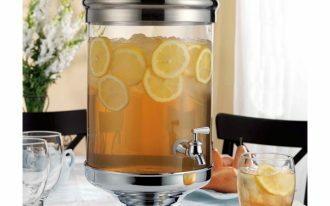 For more details, just find out the design that fits your needs and taste. Let the natural lights enter into the room through glass windows. It’s optional to shut the window shutter off if the owner wants to reduce or to minimize the lights. Based on the main theme, tropical, it’s okay to fill it with fully white tone or give it little different tones, like wood colors. Simple but so functional. You can adapt this design idea to your small house where you should be right and precise in using each space. The design uses single counter and smaller dishwasher to save the space. 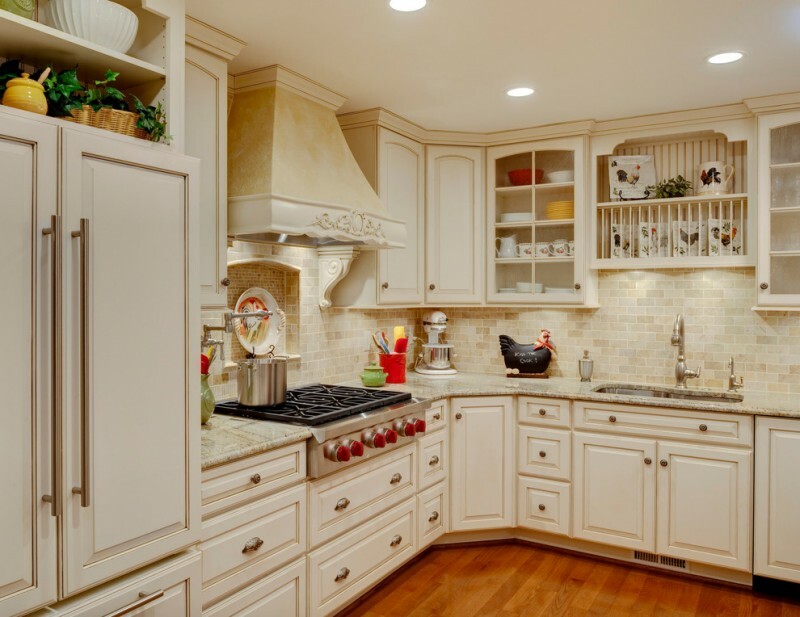 Beige and dark-tone wood color are existed to create warm nuance, so it’s cozier while cooking. For tropical lovers, it’s okay to combine your favorite theme with another contrasting style like Country. 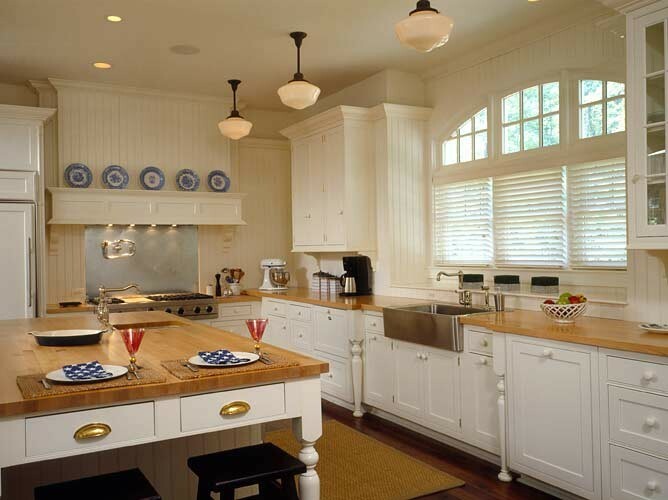 Like this one; the design emphasizes country-styled interior by furnishing the kitchen with country-look properties. 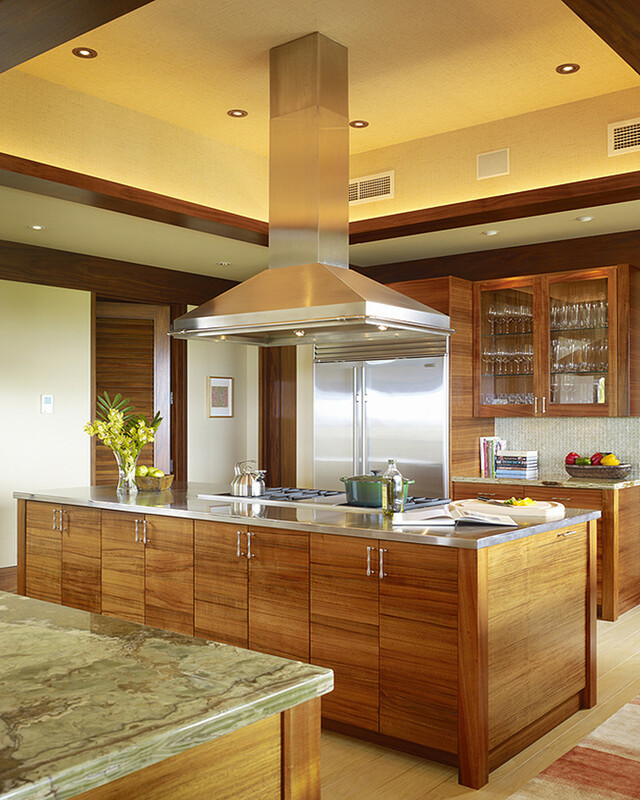 Just little tropical influence added to create Hawaii kitchen concept (cabinet’s tone, for instance). It’s awesome to blend traditional and coastal styles into one concept. Traditional influence looks dominating the space, while coastal appeal can only be found at the use of white color tone. Something unique and interesting from this kitchen. Two layers and angled counter in which each layer has different function. Lower counter is commonly used to cover food preparation and all things related to cooking, while second layer is used as bar table where the foods can be served. Need an idea of large kitchen? Probably this one can be your best alternative for your home. The design uses pine as the main material of kitchen floors. 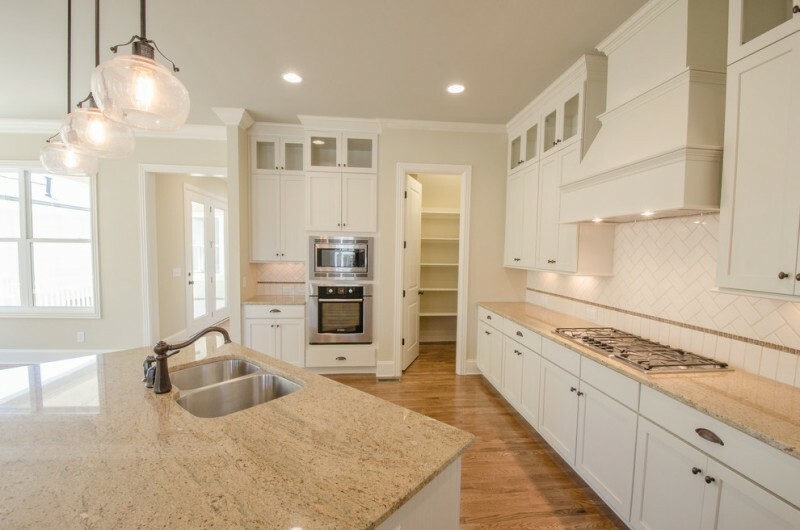 To make it balance, the designer applies light beige granite countertop and island with white for the base. 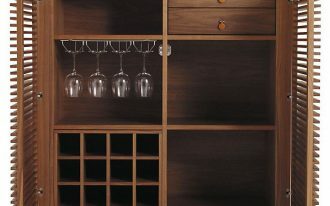 The existence of recessed lamps under the cabinets provide low-lighted look for counter and surroundings. Pear green and navy blue are the accents in which both bring the kitchen much more attractive. Isn’t it? Each color has its own role. The accent colors like navy and green here are for adding aesthetic value, and white is the creator of large-space illusion. 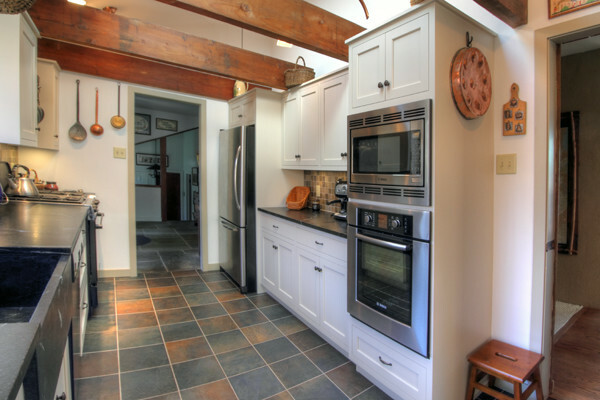 Old and shabby, but overall this kitchen is awesome because it has been blended with best quality wooden floors. The designer keeps it shabby to add dramatic and artistic appeals. The designer chooses white as the primary color, so he can combine it with other contrasting colors like black and wood color. Just take a look at the island; it has two layers of top in which the lower layer is used as the working area (prep. table) and the upper layer is used as the bar table. So interesting, right? It’s unique if we blend East and West as one concept, like this kitchen. We’ll find some Oriental accessories placed in kitchen counter. They are the special accents that make the kitchen much more interesting. 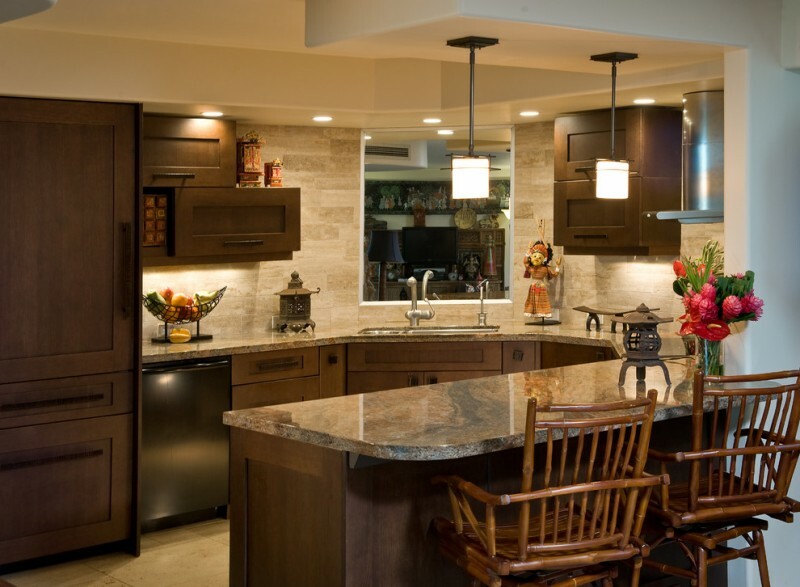 Then, dark-finished cabinets and countertop really represent natural tones of wooden and stones in which both are commonly used in Western-styled buildings. It sounds so interesting and unique if Asian and Hawaii are combined into one style. 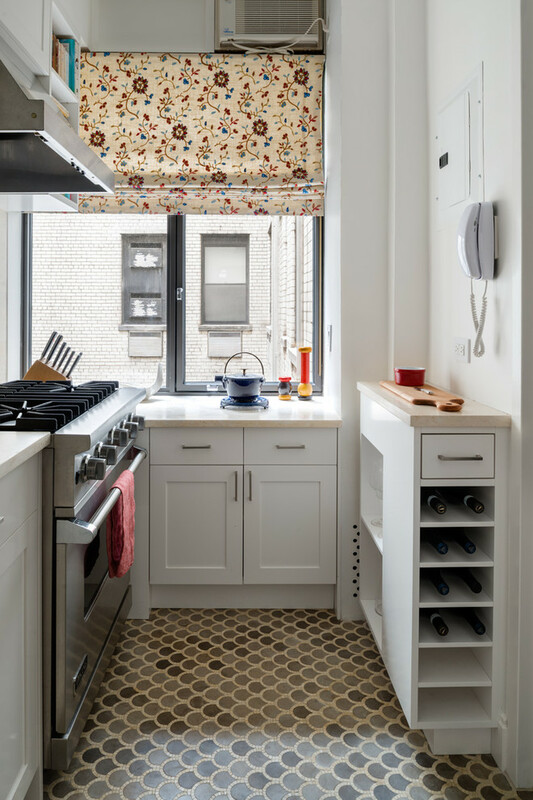 Like this kitchen design; it shows beautiful floral-pattern back splash with grey details. 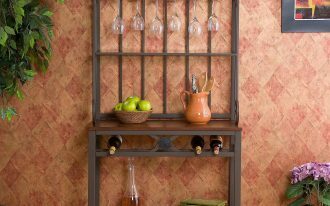 Similar pattern is also applied for kitchen walls, so Asian atmosphere is strongly felt by everyone visiting the kitchen. The series of recessed lamps under upper cabinets obviously provide low-lights that then brighten every detail of pattern. Main concept of minimalist interior design is a design which emphasizes huge of simplicity and function. 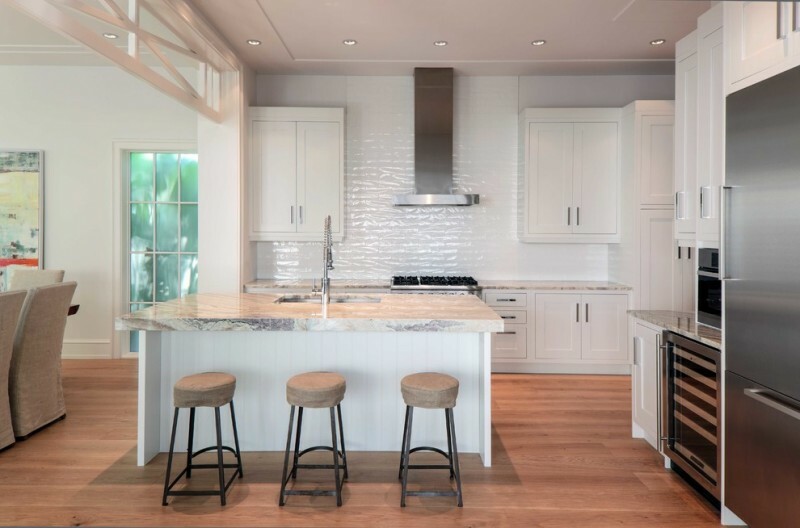 Like this kitchen; this one employs minimalist concept by concerning the simplicity of each interior items, including the furniture and kitchen fixtures. Here, the designer selects blue marine and white as the color tones describing the coastal style. 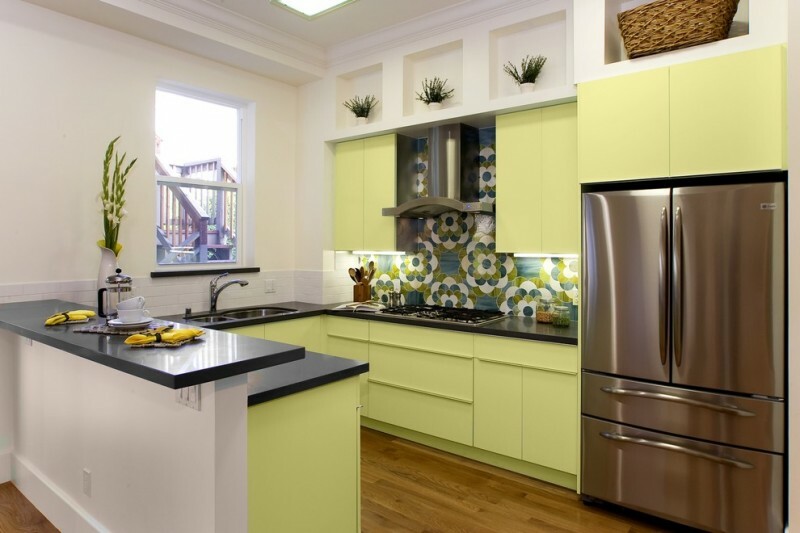 Bright green tiles backsplash becomes the brightest and most stunning part among others. 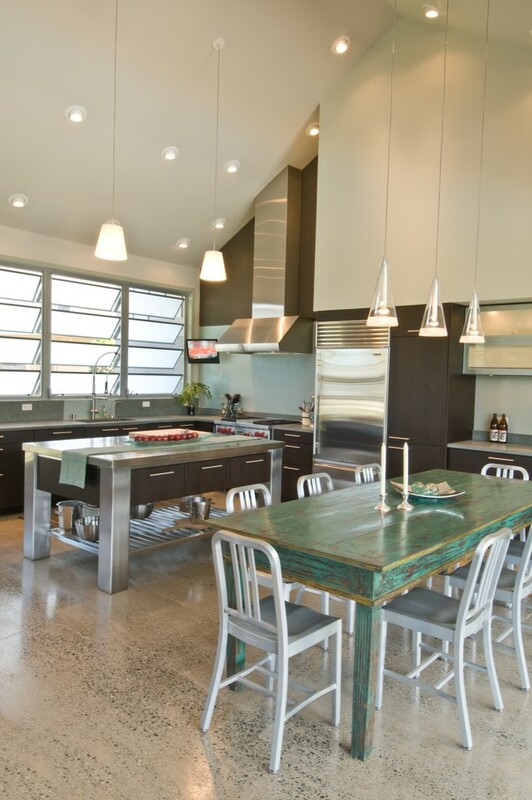 The homeowner is intentionally applied green to create attractiveness in the kitchen. Another attractiveness is also shown by the numbers of kitchen counters (more than one counter with different function) and double-layers island in which each layer has its own role. 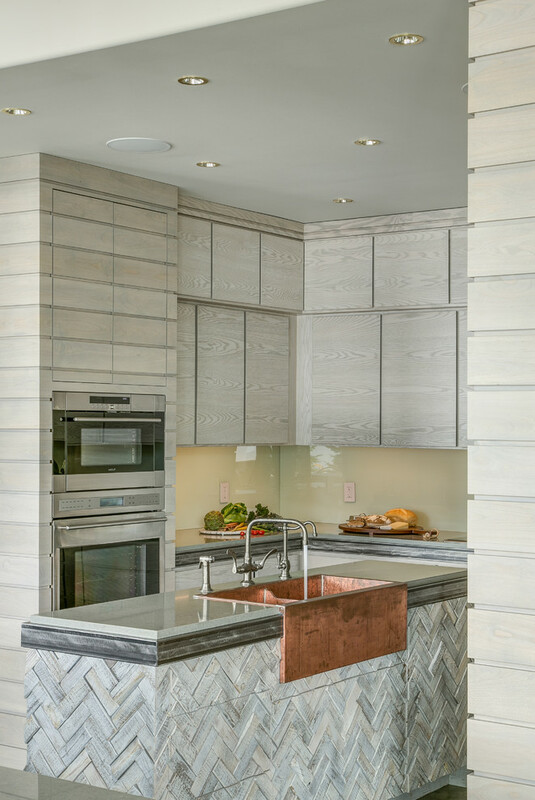 That’s so clear that the kitchen uses several coastal-themed accents like seashells which is applied as the kitchen rug’s pattern. By contrast, we’ve found few of country or traditional accents here, like floral window curtains. Full of cheerful feeling after viewing such kitchen design. 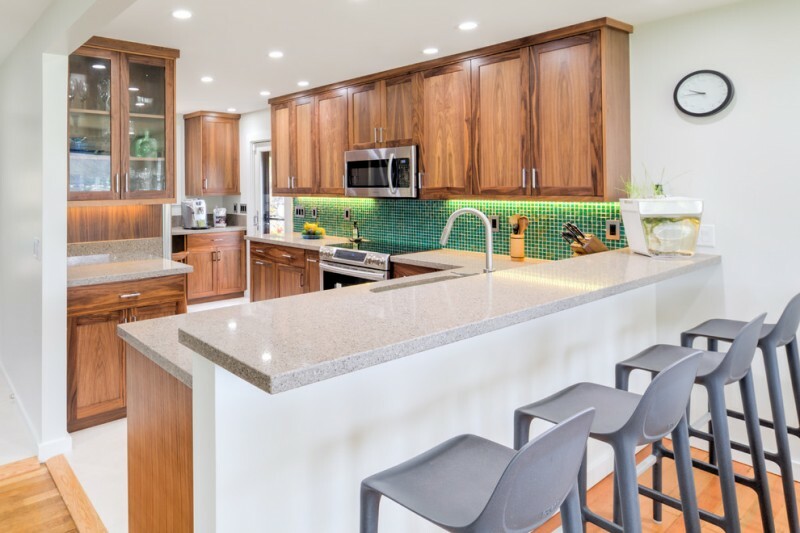 The kitchen is designed with multi-color finishes like green for cabinets and multicolored backsplash. These colors, then, are balanced by neutral color tones like wood-color floors, white walls, and stainless steel appliances. Several real plants with their pots also improve the kitchen’s beauty. 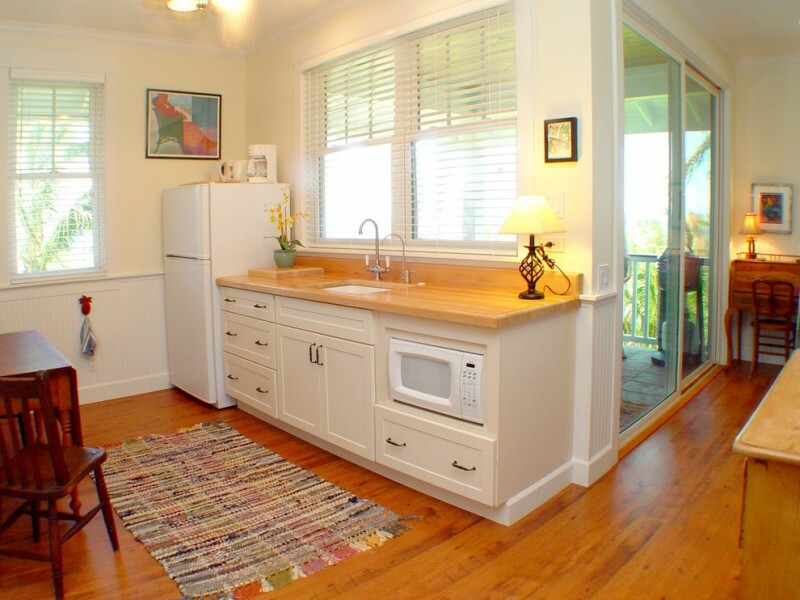 If you are looking for a simple and inviting tropical kitchen, this one is your answer. 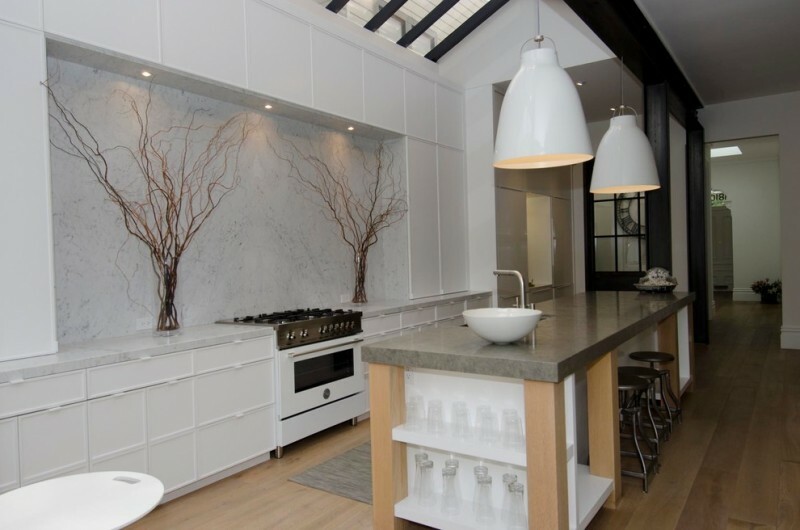 Interior of kitchen is designed in full white, particularly for cabinets, island, and walls. 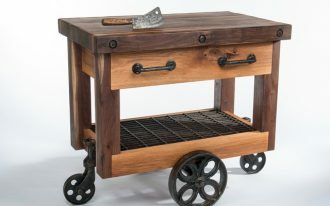 The designer has chosen wood color and metal finishes for creating a contrast look as well as the accent. Wood colors, obviously, cover the whole parts of floors and roofs, while metal finish is visibly recognized from stainless steel appliances. There are many interesting spots you may adapt. One of them is a set of dining furniture which is so inviting and stylish. Turquoise-washed finish brings the dining table much more addicted to see again and again. Another attractiveness is metal finish that’s mostly used not only for kitchen appliances, but also for kitchen furniture like kitchen island, bar, and counter. Next attractiveness is the lighting choices. 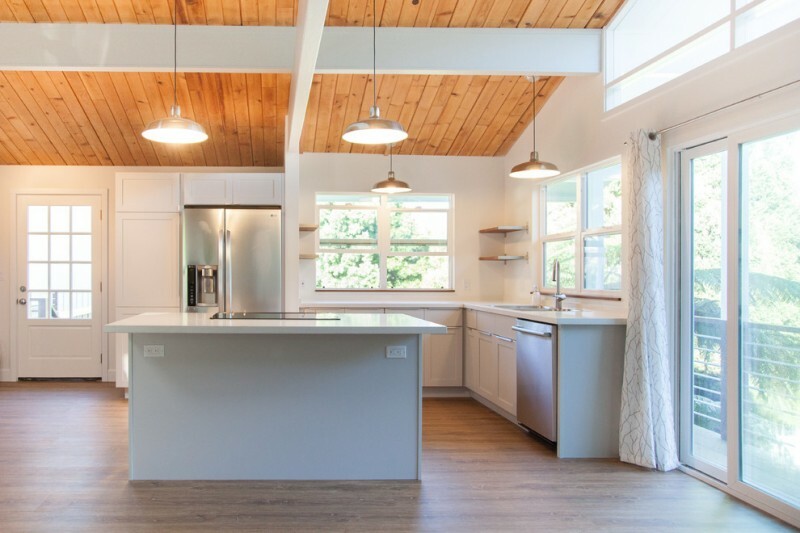 There are three types of lighting in this kitchen: recessed lamps and two different models of pendant lamps. Overall, they’re so awesome. Urban life is always interesting. 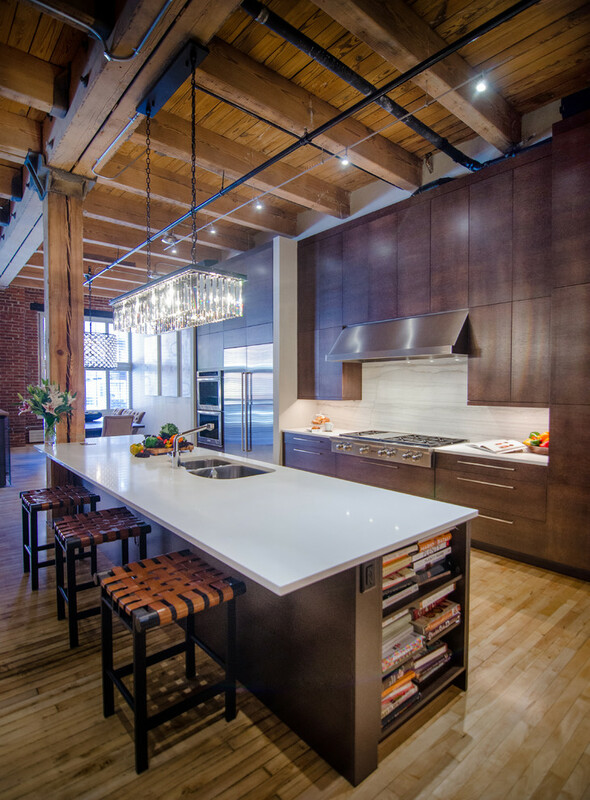 Urban people also have good taste in architecture and interior design. 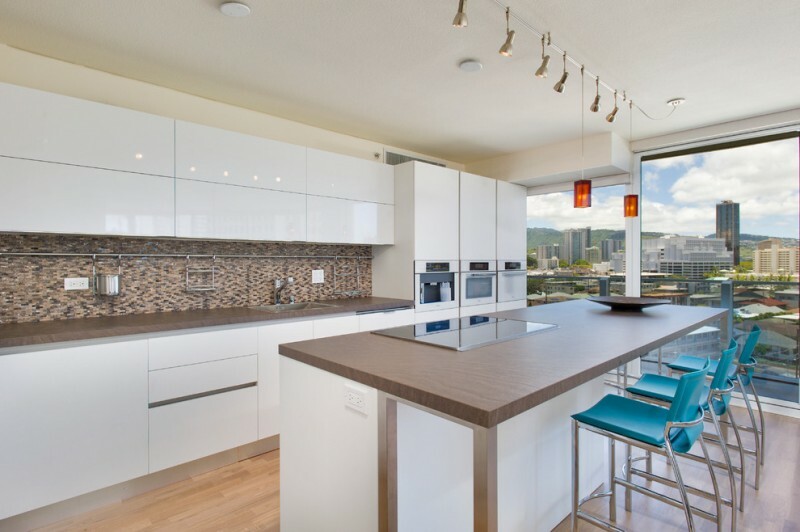 Based on picture, the kitchen has been remodeled into urban-style kitchen in which the designer put modern influence and nature-accent as one concept. 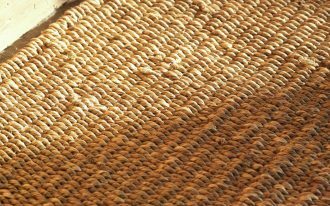 All materials used are mostly natural, and each interior item is designed in modern. This is called an urban’s taste. What a wonderful if we add a unique and beautiful wall art in our kitchen walls. This one, for the example, displays gracefully dried-trees as the wall’s arts. The wall arts are attached on one of kitchen walls’ spots where it has been illuminated by low-lighted recessed lamps. The lights let the trees more ‘alive’ and dramatic. That’s so pretty; a traditional kitchen is one of most recommended choice for you who want to own simple in design and optimal in function. 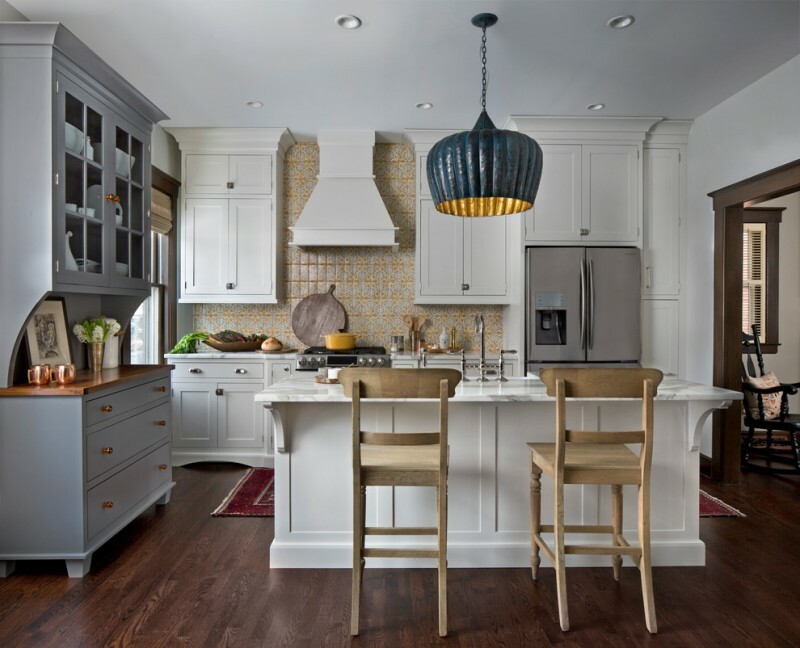 Like this one, the designer selects multicolor backsplash and dark-shade pendant lamp as the accent. In other side, traditional appeals are easily found at small cooking tools (prep board, wooden cooking spoon, wooden bowl for fresh fruits or vegetables, etc) and the sets of white classic dishware displayed on grey-toned storage. You must want to know: what parts that present Western color tones? For your information, the main concept of Western style in interior design is to optimizing the use of natural materials like wooden, stones, and metals as the main materials of buildings. Here, we clearly see that the designer still use wooden and stones as most dominant materials of building. Small counter isn’t a matter for the owner to do plenty of cooking activities. The counter is designed to cover plenty of daily usage. 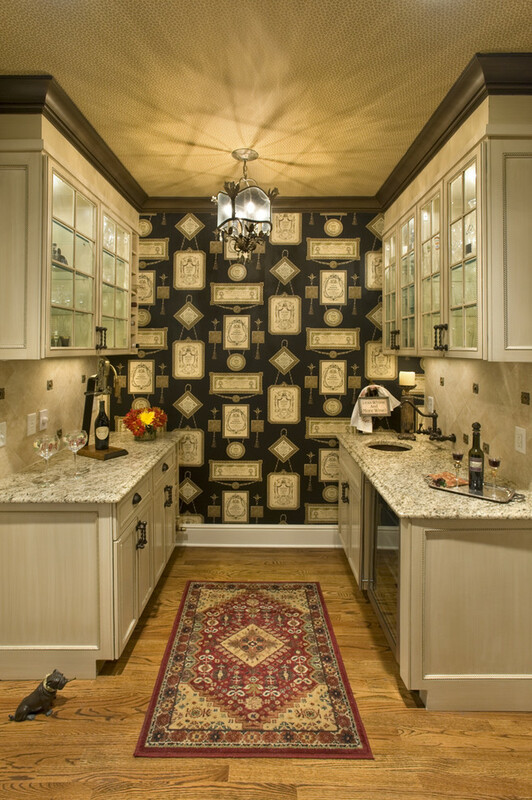 The kitchen looks so interesting with unique wallpaper installed between two counters. With this wall decoration, it’s a great idea if we want to make a party in this space. The most unique one from this design is about the cabinets. Different to other kitchen cabinets, this one is supported by chrome panels to hang the cabinets. Rustic appeal is evidently felt from the materials use in this kitchen. Natural stones which have been arranged and installed into an artistic counter-base become another attractiveness and even an accent for the kitchen itself. Everybody loves beauty, including the beauty of nature around us. You can imagine if you’re in this kitchen. Just by opening the sliding glass door or windows, you will enjoy the beauty of blue ocean and other inviting view to keep staring at. 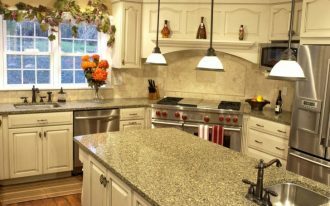 Granite, as the primary material of kitchen, also provides ultimate luxury and value. Many such places are used to make the parties. 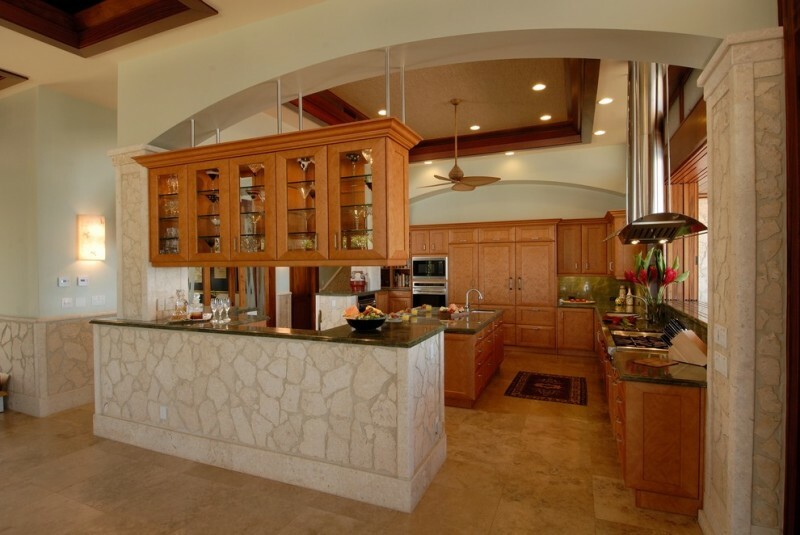 Here, we can see a custom Hawaiian kitchen design which is equipped with a smaller island, customized with wood base. The base is garnished with whitewashed herringbone patterns, so it’s so stunning among other. It looks much more attractively contrast after being collaborate withe copper-toned farmhouse and stainless steel faucet. 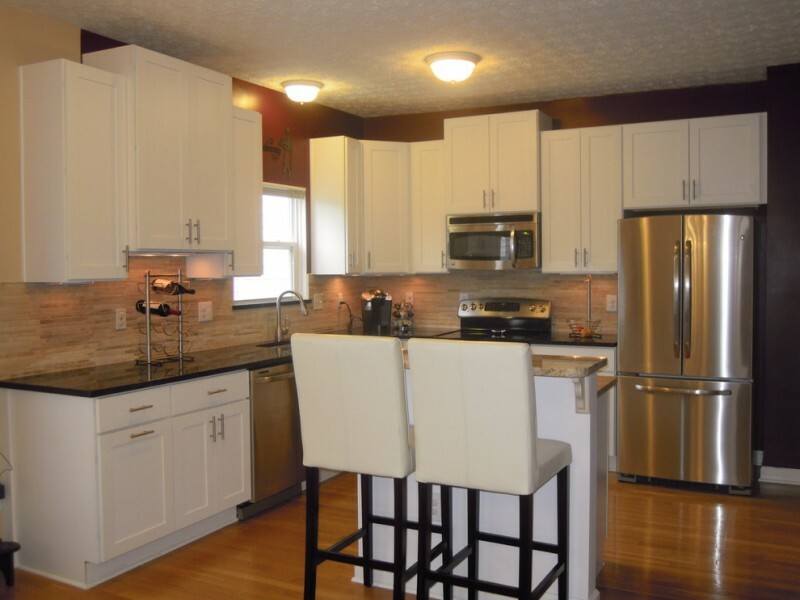 Not only that, the kitchen cabinets have been covered with uniquely pale wood-color as their finish. Another beauty is also discovered from white granite finish for the whole parts of countertop. The designer chooses white as the dominant tone by aim at creating large, luxurious, and clean appearance. 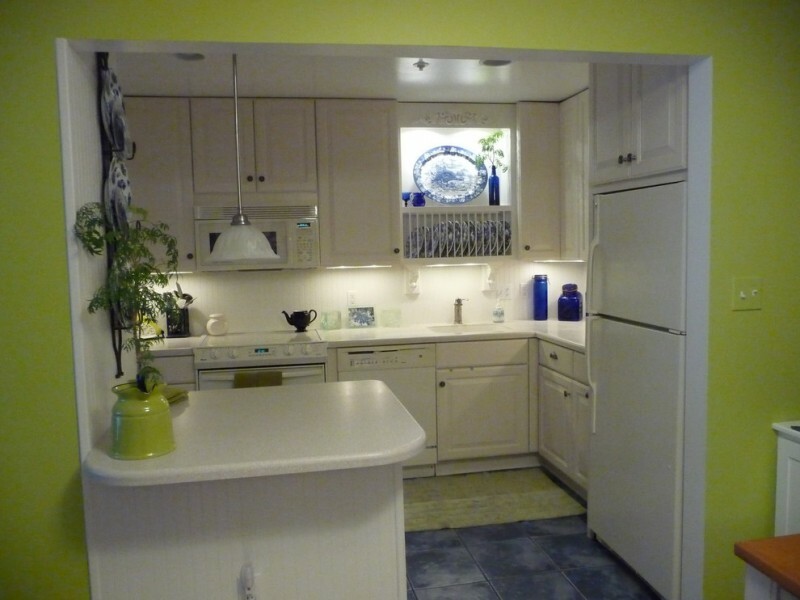 Just few spots of kitchen aren’t white, like floors, kitchen utilities, and stools. When these components are laid out, it must result best and precise proportions, especially for the tones. 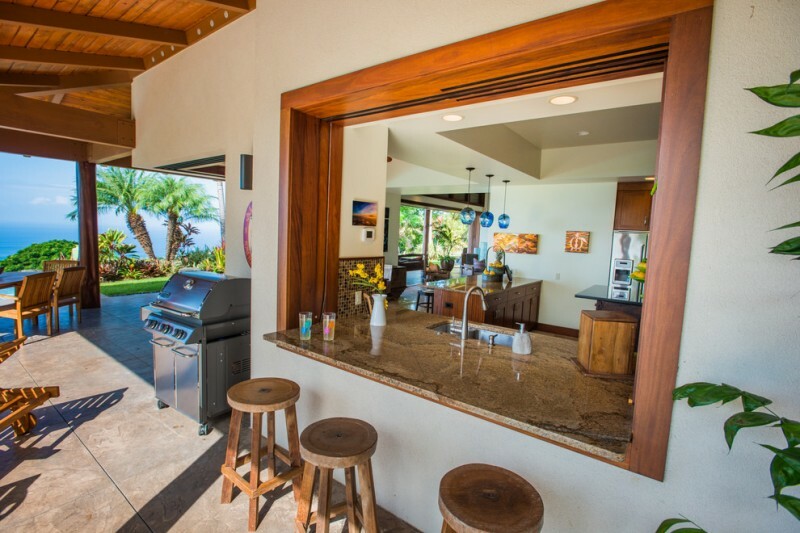 Have ever seen an outdoor tropical kitchen idea like the picture above? Yes, that’s really true that the design is so unique and attractive. 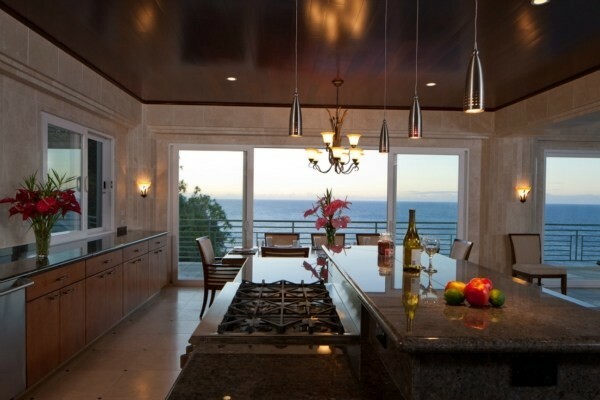 Just focus on the kitchen island and say what you see? The island has been extended to bar table. So, it’s possible to use similar surface for dual functions: for daily use of prep. foods and to serve dishes. 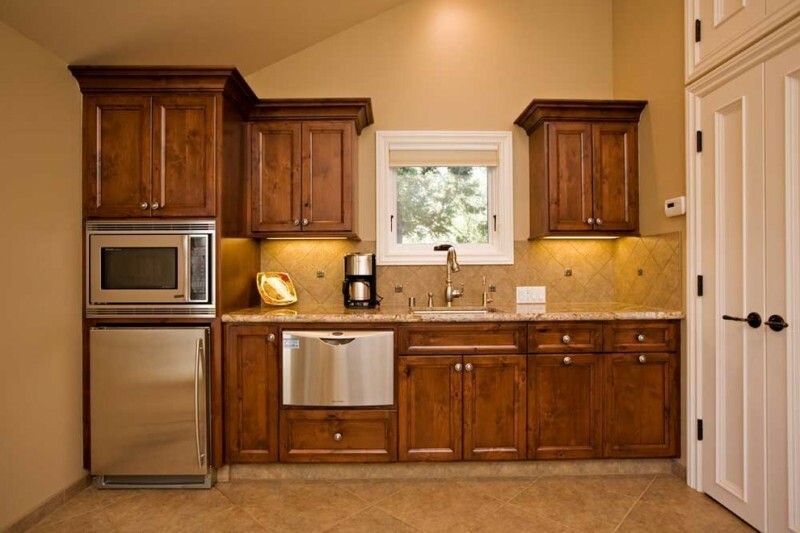 There are two significant differences we’ll find from this kitchen design: backsplash and window choice. 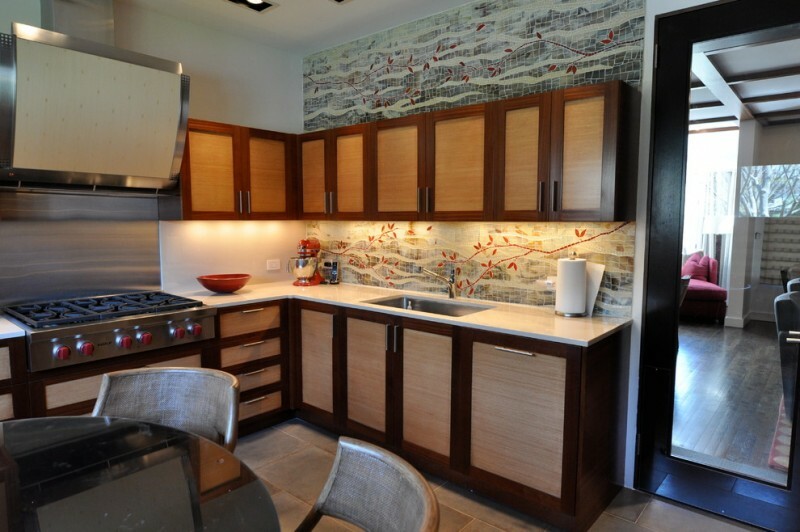 Compared to other common kitchen designs, this one has multicolored-mosaic backsplash along the L-shaped counter. Next, the windows here are set and installed in many numbers, not just one or two. Such window choice is probably connected to the kitchen’s theme: tropical. It’s too dark, indeed, yet stylish. Balance it with lighter-toned interior items like grey (for kitchen counter and island), stainless steel finishing, and beige for floors. Be sure to select white-lighted lamps to create best ambiance. 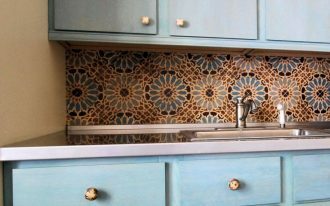 Like the main theme: Hawaiian kitchen design; this design exhibits the best color tone representing the beach, deep and blue ocean, and other things related to marine. 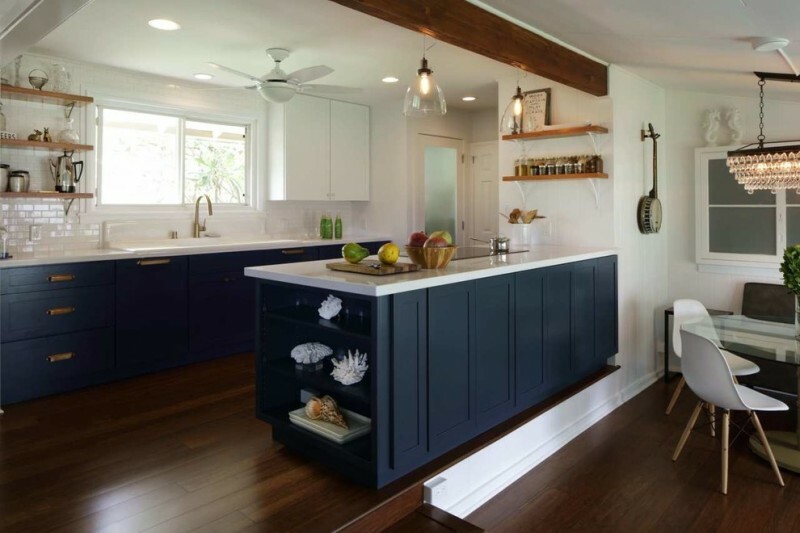 Blue navy is visibly applied on island and cabinets. They’re so striking after the designer combines them with white color.